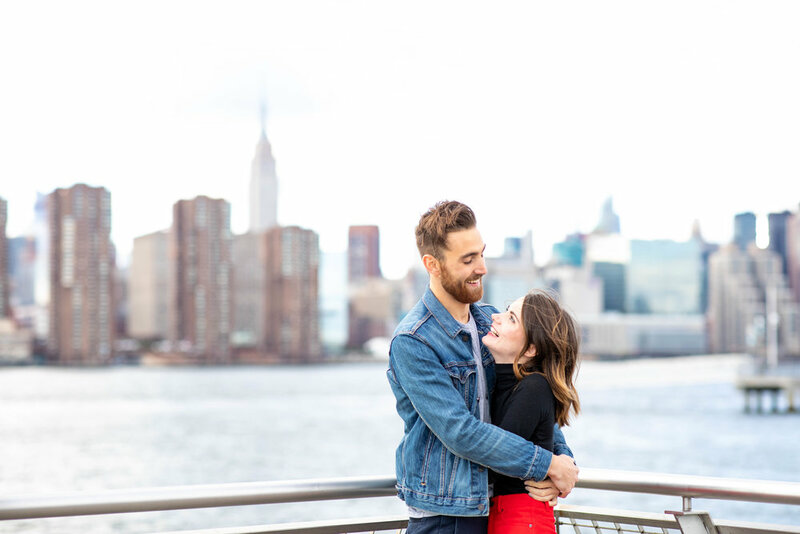 I met Stephanie and Mike on one of the first crisp Autumn weekends in NYC for their engagement photos. We met up at Transmitter Park in Greenpoint where the wind was in high gear along the waterfront (fortunately I didn’t need to bring my wind machine ;). We casually shot out along the pier to get some cityscape shots in the background, and then moved closer to the water’s edge. The sun made an appearance just as the late afternoon wind was getting to be too much to bear allowing for a few last shots before moving to the streets. The Greenpoint Loft served as a fabulous backdrop as well as the graffiti walls along the side streets off Franklin Ave. Our last shot was in front of a perfectly placed corner convenience store with a whole lot of character. I was super impressed with Stephanie and Mike’s style, ease, and not to mention Stephanie’s heavenly rose cut diamond ring (way to go Mike! ), and I can’t wait to shoot their January wedding :)!